Yields an abundance of delightful fruit for the autumn season. 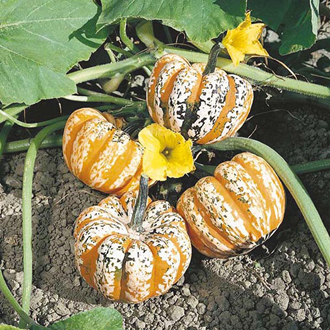 Perfect for use in your Harvest Festival displays as well as for baking, stuffing and as an accompanying vegetable. (Compact vine). Sow indoors, March - May, one or two seeds, 1.5cm (½”) deep, in 7.5cm (3”) pots of seed compost. Harden off and plant out to growing position in June, allowing 1.2m (4’) between plants. 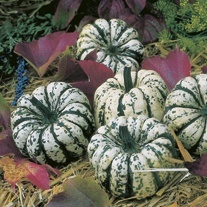 Or, sow outdoors, late May - June in the growing position. Pinch out the growing tip of each plant once five fruits have started to form and water well, especially in dry weather. Turn fruits to ensure uniform colour and shape. Harvest: July to first frosts. Store for later use in cool, dry conditions.